This monograph contains a critical evaluation of the present research state within political methodology and a classification of the current discussion into a methodological development that has bin ongoing over two millennia. It furthermore offers some suggestions for the future development of political methodology. The focus is on the dispute known as “Methodenstreit”. Its beginnings date back to the 19th century, and at the beginning of the 21st century it can justifiably be called a “methodological science war”. Firstly, an ad fontes reconstruction of naturalism, positivism or scientism is undertaken by means of methodical books and classic literature, demonstrating that the issue lies not with the mainstream but with the establishment. Then, the opposite view is presented, using the example of the phronetic perestroikans, who undertook the last great rebellion against the establishment. The limits of applied methodologies are identified, both of the scientistic (normative rational choice theory) as well as the phronetic kind (applied phronesis) . Furthermore, a case is made for the need for a genuinely practical (normative, pragmatic and technical) methodology that is complementary to an empirical (descriptive, explanatory and prognostic) one. 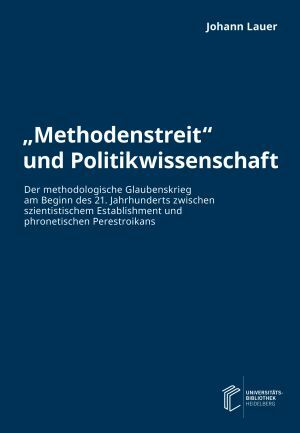 The monograph - „Methodenstreit“ and Political Science: Methodological Science War at the Beginning of the 21st Century between the scientistic Establishment and phronetic Perestroikans - is published in three media formats. Firstly, this monograph was published as a book and is commercially available for 39,90 € as a hardcover (amazon.de or buchhandel.de). Secondly, in addition to the book, a second linear text version consisting of PDF files has been placed online: http://books.ub.uni-heidelberg.de/heibooks/catalog/book/304?lang=en. These files are best suited for printing on paper, unfortunately only in German at present. This eliminates the need to go to the copy shop to print the book or sections of it. Thirdly, this website contains a transient text version. This hypertext consisting of HTML files is ideal for reading on screen, only in German at present. The transient text makes it easier for the reader to receive an overview of the work and navigation within the text. Furthermore, it enables quick evaluation for advanced users and provides an optimal introduction to the subject matter, in particular by making it relatively easy to understand complex relations and contexts. The monograph is currently only available in German, exceptions: abstract, charts and introduction are in English.